MPAA Rating: PG for action/peril including gunplay, some thematic elements and rude humor. Language: French with English subtitles. Running time: 106 minutes. Distributed by GKIDS. Avril et le Monde truqué, known to us as April and the Extraordinary World, would probably be better described by its original translated title, April and the Twisted World. I’d like to think the use of Extraordinary instead of Twisted is a nod to its alternate timeline of human history, but Twisted must have been seen as a less-than-family-friendly word to use for American audiences. It is more apt when describing this skewed reality where humanity never progressed past the Age of Steam and animals hold conversations with their on-screen human counterparts. Not in a Disneyfied way, either; it’s not like a pet can only communicate with its owner and vice versa. Animals given voices help make this fable more of a cautionary, at times heavy-handed tale of environmental issues and the damage humans do to ourselves and to the planet. 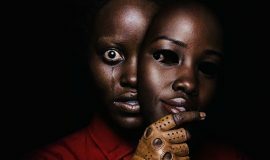 It’s an uneasy dichotomy between keeping April and the Extraordinary World light-footed and darkly preachy, and that’s where the film fumbles a bit. Of course, when you juggle steampunk, science-fiction, comedy, drama, family conflict, and war, all while trying to deliver a message to the audience, something will get lost. 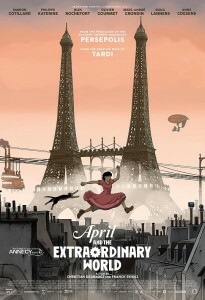 However, that’s not to say April and the Extraordinary World isn’t worth your time. Personally, I’d like to go back and watch it again to enjoy it for what it is: a movie about hope. For all of its mild faults, it’s extremely optimistic among its drudgery-filled, pessimistic leanings, and it’s a rich film with marvelous messages about intelligence, science, gender roles, and family. And it’s got a very funny talking cat, to boot. So why is there a talking cat? It all has to do with scientists chasing the “Ultimate Serum,” a compound which gives the user true invincibility, which later seems to also keep its user from aging. In 1870 on the eve of the Franco-Prussian War, we see Gustave Franklin (Jean Rochefort), a scientist trying to create this serum for Napoleon III’s military, mistakenly stumble upon a formula which imparts animals with human-like intelligence and speech. Views of animals in cages, failed experiments dressed as French soldiers or otherwise physically mangled, serve to highlight repeated ugliness to lesser beings, a recurring theme in April and the Extraordinary World. 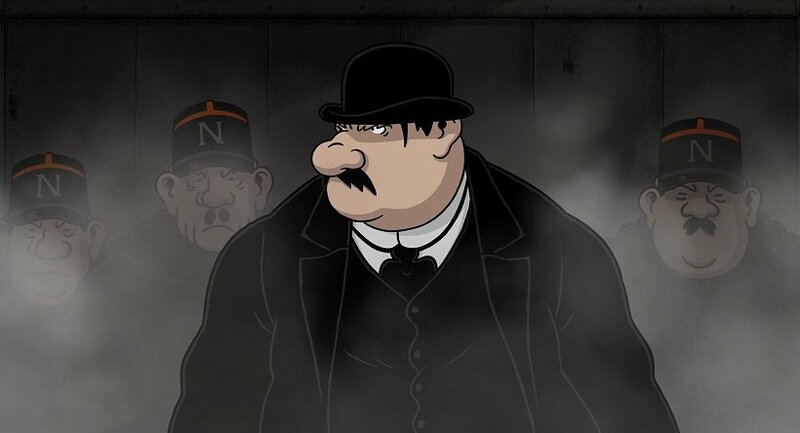 The timeline skews due to an explosion in Gustave’s laboratory, causing Napoleon V to instantly succeed the throne, sign a treaty staving off the war, and establish the Napoleon dynasty’s continued reign. However, scientists soon start disappearing, with the likes of Nobel, Pasteur, Einstein, and other notable life-changers vanishing without a trace. Inventions we currently take for granted – among them radio, television, fuel sources, even those as base as electricity – don’t exist, thus leaving humanity stuck with running everything on coal. As the coal runs out, forests are laid waste to make charcoal, polluting the air and causing France to go to war with the Americas over Canada’s forests to help solve the energy crisis. It’s as scary as a “what if?” as you can think of without having to resort to nuclear war, another discovery lost with the scientists. Carrying on Gustave’s work on the Ultimate Serum are Gustave’s son Prosper “Pops” Franklin (Rochefort again), his son Paul (Olivier Gourmet), and Paul’s wife Annette (Macha Grenon), with their young daughter April (Marion Cotillard) sleeping on a mattress in their makeshift lab next to her cat Darwin (Philippe Katerine), who seems to have been dosed with Gustave’s formula. Just as they think they’ve nailed down the serum, bumbling Inspector Pizoni (Benoît Brière) and his police squad burst down their door, as all remaining scientists have been conscripted to work for the French Empire. 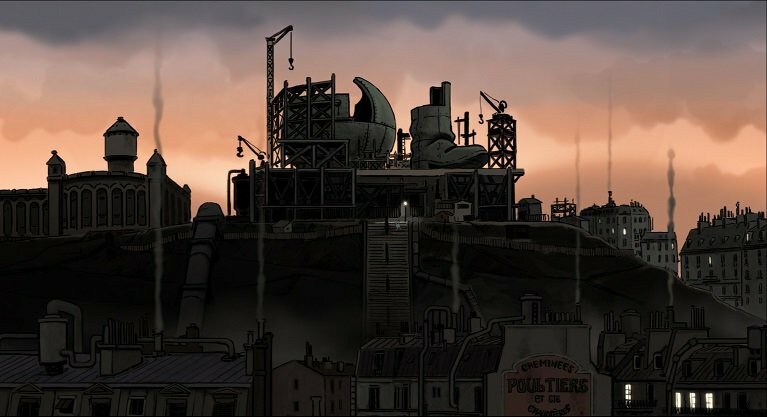 They escape only to be taken by the mysterious force responsible for the missing scientists, but not before Annette passes the serum to April, the only one who survives the incident. The bulk of the film takes place ten years after this, where April and a near-death Darwin continue her parents’ work in hiding. There’s a lot of symbolism attached to each character, which leads to the film’s aforementioned heavy-handedness. Linda Hamilton said it best in Terminator 2: Judgment Day when she said, “Men… don’t know what it’s like to really create something; to create a life, to feel it growing inside you; all you know how to create is death and destruction.” This maxim is surely taken to its hilt in April and the Extraordinary World; all the males, while maybe not as inept as Pizoni, are either portrayed as single-minded workaholics or a terrible megalomaniac driven to the “to take care of life, we must destroy humanity” endgame so readily found in science fiction. Women seem to represent the creators or those in favor of a better world, taking a gentle, more levelheaded approach to their desired ends. April represents the marriage of the two, as not only does she have the skill and the brain to accomplish her goals, she also has wisdom (a quality different than being book-smart), patience, and friendship to offer. She is the heart of the entire piece, and her strength combined with her intelligence makes her one of the best animated female characters I’ve seen in these kinds of movies, where the females are usually dropped in as afterthoughts or shoved to the side for the more forceful males. 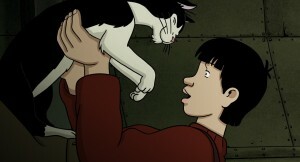 However, it’s Darwin the cat who gives this film a lot of its humanity, ironically. The humans (and other two-legged creatures I’m not naming out of spoiler respect) are oddly cold and focused, but Darwin’s bon mots and likability temper the movie, giving it an unexplainable lift. Maybe it’s because he’s the voice of reason and he’s doing what a cat does – nuzzling and being snarky toward those around him. (Maybe it’s just me with the overly snarky cat.) But he also represents everything April and the Extraordinary World stands for: a chance to live in a world full of darkness and smog. 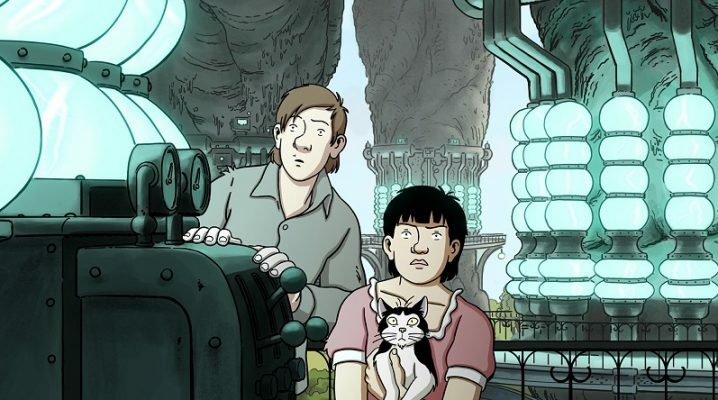 A little bit Hugo, a little bit Star Trek (both the TV show and the movies, in particular The Wrath of Khan), and a whole lot of smarts, this adaptation of Jacques Tardi’s April and the Extraordinary World graphic novel does very well for itself. It shows us the nightmare our lives could have been without science and intelligence, yet still tells a very good story you wouldn’t mind letting your kids watch. In 1977, a film named Star Wars came out that sparked the world's imagination and ignited the spirits of filmgoers everywhere. Caught up in that fervor was Eddie Pasa, a one-year-old brought to the theater by his parents; as one of his earliest memories, he cites this as the starting point for his love of cinema. He has seen thousands of movies in the intervening years, finally finding an outlet for his opinions in 2010, when Dean Rogers graciously gave him a yearlong stint at The Rogers Revue. This was followed by a two-year post at the now-defunct Reel Film News. 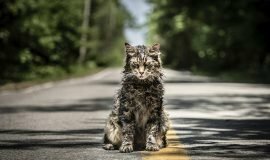 A movie doesn't have to be an Oscar-winner to get a good review - if the story, script, and acting are strong, there's nothing that can stop even the lowest-budgeted movie from being great. His current Top Ten movies are: 1. Inception 2. The Shawshank Redemption 3. To Kill a Mockingbird 4. The Usual Suspects 5. Se7en 6. The Goonies 7. Brick 8. Die Hard 9 Monty Python and the Holy Grail 10. Aliens To be sure, there are more relevant and more artful movies out there; yes, The Godfather and Citizen Kane and all of those other cinema staples are great movies. However, if put to the "It's a rainy Saturday afternoon and I want to throw in a DVD" test, these are the ones that win him over every time. 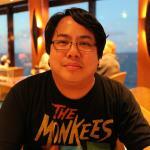 In addition to reviewing movies, he is also a drummer for Juniper Lane and plays solo acoustic shows in the area. Special thanks to Dean Rogers for getting me started, and to Jenn Carlson, Moira, and Ari for putting up with the long hours. Thanks also go to his parents and family for fostering his love of film, and for being sticklers about grammar and punctuation. Finally, thanks to Michael Parsons for joining him on this adventure. Eddie is a member of the Washington DC Area Film Critics Association (WAFCA) and a member of the Online Film Critics Society (OFCS).